72 Foot Heavyweight Coach with Lighted Interior - UNION PACIFIC #1115 (yellow, gray & red) - HO Scale. Features: prototype specific details, RP25 wheels, 4 & 6 wheel die-cast trucks per prototype, LED non-flickering lighted interior, E-Z Mate Mark II couplers, undercarriage details, interior details, flush mounted windows. 80' Pullman Car with LED Lighting - UNION PACIFIC (Lake Waccamaw) - HO Scale. The Pullman Company, built, operated, and maintained a fleet of first class passenger rail cars for many of the US Railroads. During it's peak in the 1930's Pullman operated over 8,000 Sleeper, parlor, club, and café cars. 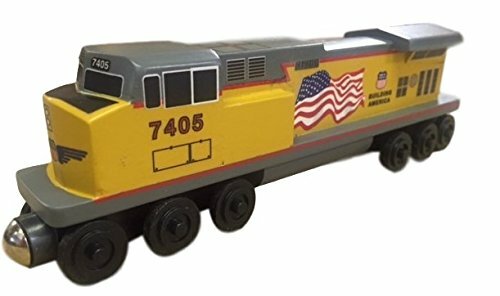 This Bachmann model features; prototype specific details, RP25 wheels, die-cast trucks, LED non-flickering lighted interior, E-Z Mate Mark II couplers, undercarriage details, interior details, flush mounted windows. 85' SMOOTH-SIDE COACH CAR with LIGHTED INTERIOR - UNION PACIFIC - HO-Scale. Bachmann's 85' Coach and Observation Cars feature lighted interiors so your HO scale passengers can ride in style, day or night. Available in a choice of road names, all cars have Metal wheels and E-Z Mate Mark II couplers. 85' SMOOTH-SIDE OBSERVATION CAR with LIGHTED INTERIOR - UNION PACIFIC - HO-Scale. Bachmann's 85' Coach and Observation Cars feature lighted interiors so your HO scale passengers can ride in style, day or night. Available in a choice of road names, all cars have Metal wheels and E-Z Mate Mark II couplers. Union Pacific "Flag" C-44 Diesel Engine. Known for our quality, Whittle Shortline Railroad wooden toy trains are compatible with most major wooden railways like Thomas, Brio and Chuggington. They are modeled after North American freight and passenger trains such as Burlington Northern, CSX, Canadian National, Canadian Pacific, Metra of Chicago, Norfolk Southern, Santa Fe and Union Pacific. Whittle Shortline Railroad toy trains have been made in The United States (Kirkwood, MO) by our family and the rest of the Whittle team for close to 20 years. 72' heavyweight observation car with lighted interior - Union Pacific #1503 - HO scale. Bachmann heavy weight cars feature; prototype specific details, blackened machined-metal wheels with RP25 contours, die-cast trucks per prototype, LED non-flickering lighted interior, E-Z Mate mark II couplers, undercarriage details, interior details, flush mounted windows. 72' smooth-side baggage car - Union Pacific - N scale. Featuring all new tooling, metal wheels, detailed underframe, and body-mounted E-Z Mate mark II couplers. 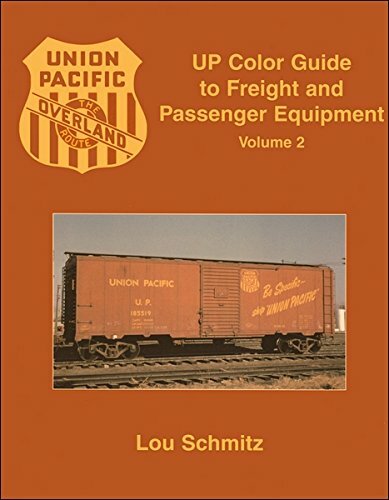 Union Pacific Color Guide to Freight and Passenger Equipment Volume 2: "Volume I gave you the UP's rolling stock through the lenses of its company photographers. Now see them through the effort of Lou Schmitz, a lifelong Omaha resident and UP employee who was photographing UP equipment throughout the 1950s and later. 300 photos, 128 pages." 85' smooth-side coach - Union Pacific - N scale. Featuring all new tooling, metal wheels, detailed underframe, interior LED lighting, and body-mounted E-Z Mate mark II couplers. Copyright © Wholesalion.com 2019 - The Best Prices On Union Pacific Passenger Online.